Candelabrum in formam ferulae, cartoon by the French caricaturist and lithographer Charles Vernier. 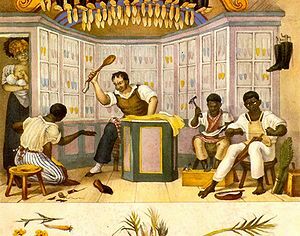 A shoemaker punishes his apprentice (slave?) with the palmatória. Painting by Jean-Baptiste Debret (1768-1848). 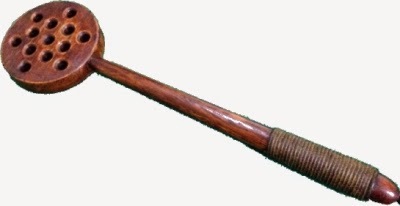 The ferule (pronounced IPA: [ˈfɛruːl], the anglicized form of ferula, "rod") is a wooden implement designed to strike the hand of a person for punishment. 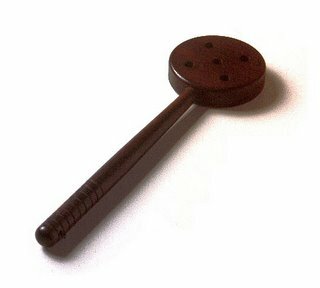 It was mostly used in schools by teachers and headmasters to punish unruly students, striking the disk part into the palm of the student. The corresponding verb is to ferule, and a punishment with a ferule is called a feruling. Another english term for it is palmer. A ferule is much like an improved version of a wooden spoon. Its business end is a flat disk, approximately the size of a hockey puck, connected to a long handle. The main difference from the typical U.S. spanking paddle is the size and shape of the business end. Ferules were not designed to be used on the buttocks, although that would also be possible and ferules may also have been sometimes used in that fashion. The term ferule is recorded from 1566; Middle English ferul. The term "ferule" also had the secondary meaning "school discipline". a long rod with which until recently priests of the Vatican Sacred Penitentiary lightly touched penitents. 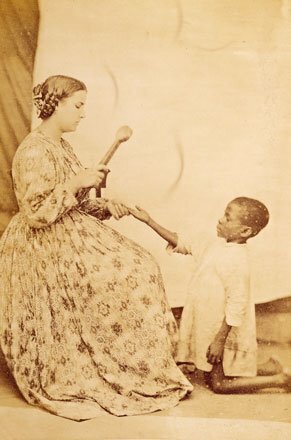 a cane with a short transverse on top with which clergy and the people would support themselves during liturgical services before sitting down was allowed. 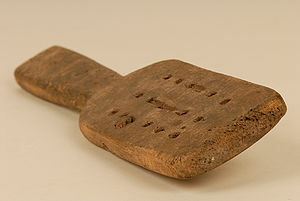 a piece of whale bone, possibly covered in leather, rubber, or Gutta-percha, also used for corporal punishment in schools. 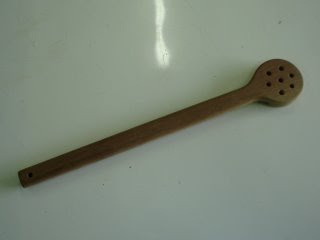 other spanking implements, such as a cane or stick. The word ferule is not to be confused with the differently spelled ferrule. Ferrule is a name for types of objects (usually round and made of metal) used for fastening, joining, sealing or reinforcement. 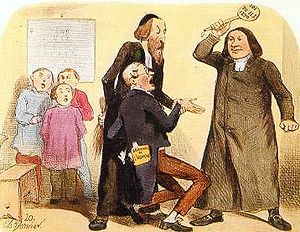 In England, ferules were used for school corporal punishment until the 19th century. They could be made either of wood or occasionally also of hard leather. The business end was wider than the handle end, and could be circular, elliptical, or pear-shaped. Sometimes it featured a hole in the middle which increased the pain and could raise blisters. Because of the five holes, the implement was also known as "menina de cinco olhos" (literally, "five-eyed girl"). The palmatória was often made from heartwood, e.g. from cedar, for a long lifetime. The number of strokes given would depend on the offense. A Dúzia de Bolos (a "dozen cakes") meant six strokes on the left hand and six on the right hand. If a student closed his hand during the punishment (or pulled it away), there would be extra punishment. This method of school punishment was common up to the first half of the 20th century. Note that the word palmatoria, without an accent, is Spanish but has a different meaning. It (mostly) means candlestick. Palmatória is also the common name of a cactus named Opuntia monacantha that grows in South America. A Spanish palmeta de castigo. In Spain and Spanish speaking countries, the ferule is called palmeta (or palmeta de castigo). The palmeta has holes drilled through and is often not round but more rectangular. It may have been used more in the fashion of a paddle on the buttocks than like a ferule on the hand. In Swedish, the ferule is called Färla. It was used on the buttocks or on the hand, but never on the writing hand. In Swedish sources, we often find a pairing of a birch rod and a Färla. In Dutch, the ferule is called plak. It is prominently featured in 16th and 17th century Dutch paintings of school scenes, such as by Pieter Brueghel, Jan Steen, Adriaen van Ostade and Jan Luyken. Fresco at Tuse church, Denmark depicting Jesus going to school. The schoolmaster holds a ferule and a birch rod. Late 1100s. A master strikes a boy's hand with a palmatoria (c. 1309-1316). Ferule from Sweden, c. 1450. Coat of arms of Morten Børup, who was headmaster of Århus Cathedral School, Denmark, from 1491 to 1520. Coat of arms of Katedralskolan, Uppsala, Sweden. Seals of Örebro school, Sweden, from 1555 and 1579. Scene in a Dutch School. Schulstube mit Portrait einer Familie (Schoolroom with portrait of a family), painting by Jan Miense Molenaer (1634). A schoolroom interior by Matthys Naiveu (Dutch, 1647 - 1721). The Schoolmaster, painting by Adriaen van Ostade (1662). De schoolmeester by Jan Steen (1663). Der strenge Schulmeister (The Severe Teacher), painting by Jan Steen (c. 1668). Schoolmeester geeft een jongen de plak by Jan van Somer, 1676. The Dutch School, engraving by John Smith (circa 1681-1688). Schoolmeester (Schoolmaster) by Dirck de Bray, c. 1650-1694. El Maestro de Escuela (The schoolmaster) by Manuel Murguía, Mexico (1854-1855). Unknown artist or date, from School Museum Rotterdam. Ferule from School Museum Hamburg. 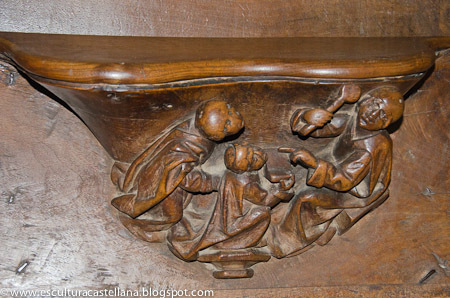 Sculpture of a teacher spanking a student in the horsed position with a ferule, in the Museo Pedagógico in Montevideo, Uruguay. Photo of a beautiful ferule — this one may have been a symbol of guild office.